When you want a buttery sweet cookie, with wonderfully crisp edges, try these Butter Cookies. They are very nice with a hot cup of tea or to serve alongside a bowl of sorbet or fruit salad. I think the best way to describe them is to say they are like a sugar cookie only not as sweet. You can form the batter into a log shape so you can slice and bake the cookies on demand, or you can chill the dough and roll it out to make cut-out cookies. Before baking you can sprinkle the cookies with sparkling sugar or chopped nuts. Another option is frost the baked cookies with confectioners frosting or to dip the ends in melted chocolate. Sometimes I even like to take two cookies and sandwich them together with jam, lemon curd, or a chocolate ganache filling. So as you can see this is a versatile cookie that would be perfect for the Christmas season. So as I mentioned above, once the Butter Cookie batter is made, I like to divide it in half and each half is formed into a round or square log. Cover each with plastic wrap and then place the logs in the refrigerator to chill until firm (several hours but preferably overnight). Or the unbaked logs can be frozen for a couple of months. When you are ready to bake the cookies, slice into 1/8 - 1/4 inch (.3-.5 mm) thick cookies. The thinner you slice the cookies, the more crisp they will be. If you like you can brush the tops of the unbaked cookies with an egg wash and then sprinkle with chopped nuts or sparkling sugar. Bake the cookies until the edges are golden brown. The longer you bake the cookies the more crisp they will be. You can frost the baked cookies with a confectioners frosting (recipe included) or dip half the cookie in melted chocolate. Butter is the focus in these cookies and there are many high quality foreign and domestic brands to choose from. European-style butters have a higher percentage of butterfat (86%) than American-style butters. American-style butters have about 80 percent butterfat, 18 percent water, and 2 percent milk. They are graded by letter code, and sometimes a numerical number, according to flavor, color, texture, aroma and body. Butter with a AA (93 score) makes a nice tasting cookie and I like to use unsalted rather than salted butter. Unsalted butter does not contains salt so its pure sweet buttery flavor shines through. Salted butter contains salt which can overpower the sweet flavor of the butter and can also mask odors. Also, the amount of salt added to salted butter can vary from manufacturer to manufacturer. So if you use salted butter in this recipe, omit the salt in the recipe. Butter Cookies: In the bowl of your electric mixer, or with a hand mixer, beat the butter and sugar until light and fluffy. Beat in the egg, zest, and vanilla extract. In a separate bowl, whisk together the flour and salt. Gradually add the flour mixture to the creamed mixture and beat just until incorporated. Scrape down the sides of the bowl as needed. Divide the dough in half and shape each half into a log (round or square) that is about 1 1/2 inches (4 cm) in diameter. Wrap each log in plastic wrap and place in the refrigerator until firm (at least two hours or preferably overnight). (Can freeze the unbaked logs for up to two months.) Once the log is firm, with a sharp knife, slice cookies about 1/8 - 1/4 inch (.3-.5 mm) thick. Preheat oven to 350 degrees F (177 degrees C). Place oven rack in the center of the oven. Line a baking sheet with parchment paper. Place the cookies on the baking sheet, spacing about 2 inches (5 cm) apart. If you like, make an egg wash by beating one egg white with 1 teaspoon water. 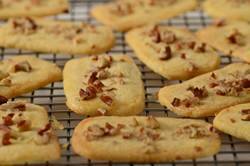 Brush cookies with the egg wash and sprinkle with chopped nuts or colored sugar. Bake the cookies for about 10-15 minutes, or until the edges of the cookies are golden brown. Remove from oven and place on a wire rack to cool. Unfrosted, these cookies can be stored several weeks at room temperature. Frosting: In the bowl of your electric mixer, or with a hand mixer, beat the butter and shortening until smooth and well blended. Beat in the vanilla extract. With the mixer on low speed, gradually beat in the sugar. Scrape down the sides of the bowl. Add the milk and beat until frosting is of spreading consistency. Add more milk or sugar, if needed. Can tint portions of frosting with desired food color. Green, Aliza. Starting with Ingredients Baking. Running Press Book Publishers. Philadelphia. 2008. Waters, Alice. The Art of Simple Food. Clarkson Potter/Publishers. New York: 2007.